Central Kalahari Game Reserve Safari Holidays: Thakadu Camp and Safaris is situated near Ghanzi Village on it's own private game reserve in the land of the “Khoi San” or Bushmen. Situated 670 km from Gaborone, 500 km from Windhoek and 280 km from Maun. Previously extremely remote, Ghanzi is now served by the new Trans Kalahari Highway which was completed in the late nineties. Thakadu overlooks a natural pan with permanent water, surrounded by ancient "motswiri" or leadwood trees. The pan attracts large numbers of Kalahari game and a fabulous variety of birds. Thakadu was opened in early 1999 with a view to providing affordable accommodation and camping in as natural as possible a Kalahari setting. BAR & RESTAURANT: Establishment have a well stocked bar, which is a popular waterhole by the waterhole. Hosts' cosy restaurant overlooking the pan (waterhole) provides excellent a la carte meals at reasonable prices and a selection of wines is available. A raised swimming pool is available for guests which also overlooks the pan. GAME DRIVES, HORSE TRAILS, BUSHMAN DANCES: Bush walks, Bushman guided walks, game drives (including night drives), horse trails and bushman dances are available but should preferably be organised in advance. Establishment undertake guided Safaris countrywide for up 4 people but specialise in the Central Kalahari Game Reserve and Tsodilo Hills. EASILY ACCESSIBLE: The turnoff for Thakadu is 3km. South of Ghanzi on the road to Lobatse and Namibia and is 39 km north of the Trans Kalahari Highway junction with Namibia. The turn is clearly signposted on the right. A three km rocky trail will bring you to Thakadu. Although quite rough, the road is negotiable by even the lowest 2WD's. 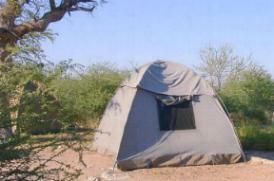 Fully bedded pre-erected safari-style tents. These provide comfortable budget accommodation. All are equipped with electric light and utilize the campsite ablutions. The luxurious raised meru tents (a chalet canvas) provide wonderful rustic comfort. They have electricity and abundant hot water for dusty travellers. Cars can be parked close by and the merus are a short walk from the the bar and restaurant. They are either twin or double bedded, and up to two extra beds can be added for kids. An early morning call is laid on by red -billed francolin (whether requested or not!). The chalets are elevated with balconies overlooking game rich veld, within short walking distance of the restaurant an bar. Vehicles may be parked directly outside the chalets which are double bedded with extra beds provided if necessary for kids. They are air-conditioned and safes are provided. All sites have power points and water/hot showers. 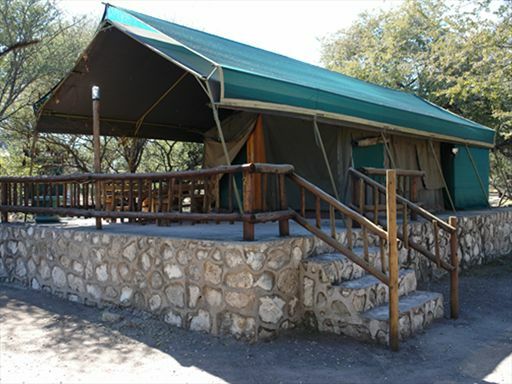 Campsites are all situated under shady leadwood trees with an electric light, power point, drinking water and braai pit. Campsites are all within a short distance of our 2 ablution blocks. Firewood is also available. 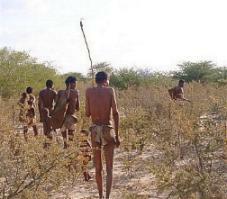 The San activities at Thakadu centre around a loosely knit group of Nai Nai bushmen who come mostly from the central areas of the Central Kalahari Game Reserve (CKGR). This population became the basis for the settlement of Xade and ultimately New Xade. The name Nai Nai translates directly as “people of the bush” thus they consider themselves to be the true bushmen. To walk with these Bushmen and witness their skills as gatherers and trackers firsthand, is a revelation not easily forgotten and if requested they are available for traditional dances in the evening around the fire. Game drives and night drives are available on Kabakae Game Reserve where large herds of Eland and other Kalahari wildlife may be seen. There are also a huge variety of native, vagrant and migratory birds. Clients are also welcome to use their own vehicles on our network of roads. 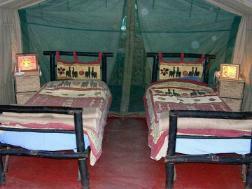 We also provide guided bush walks or for the adventurous, we have a number of hiking trails. Guided horse trails are possible throughout the property. Definitely the best way to view game. A reasonable degree of horsemanship is needed for these trails, and they need to be booked in advanced.